Do you like mangoes as much as I do? The taste of a ripe, juicy mango is among the best things ever for me. Sprinkled with a bit of pepper and a squirt of lime juice, a mango is a treat I crave often, especially in summer. Mango Nectar includes notes of Bitter Orange, Pink Grapefruit, Mango Leaf, Mango Nectar, Apricot Blossom, Jasmine and Musk. Mango Nectar is hands-down my favorite in the bunch. A juicy. green, leafy, sweet-but-not-too-sweet imitation of nature, this perfume is a mango lover’s heaven. It is not complicated, but a straight-forward, drop-dead gorgeous mango scent, that smells, exactly – and I mean exactly! – like the fresh fruit. It’s delicious and it makes me and my kids squeal with delight (which in turn makes my husband shake his head and roll his eyes, but that is another story). A Shot Of Oud Over Mango includes notes of Mango, Black Pepper, Freesia and Oud Wood Accord. The second of the Mango Collection fragrances combines the trend note oud with mango. An interesting concept, but one that doesn’t really work for me. The perfume opens sharply with a hit of black pepper and the band-aid charms of oud. Mango tries to assert itself but is constantly drowned out by the male swagger of the oud accord dominating the perfume throughout. The perfume seems to me like a girl in a floral summer dress adding a rocker-chic leather jacket and combat boots to her outfit and starting to growl at people. This is designer Rick Owens, not my husband. In all probability both smell like A Shot of Oud over Mango. This perfume on male skin on the other hand worked like a charm. On my husband, A Shot of Oud over Mango smells incredible. He can pull off that leather jacket (just don’t tell him about the floral dress underneath!). A Shot Of Thai Lime Over Mango includes notes of Mango, Kaffir Lime, Black Pepper, Freesia, Mint Leaves, White Thyme Absolute and Vetiver. A Shot of Thai Lime over Mango (aside from its unwieldy name) is surely the most interesting and complex composition of the three. The fragrance opens with a fantastic accord of lime and mint leaves, that immediately bring to mind a cocktail (which was Ms Malone’s inspiration). 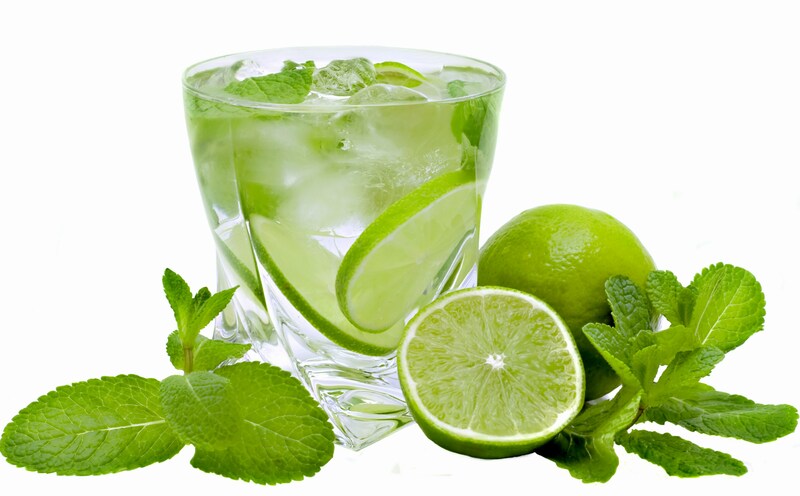 A Mojito with lots of mint, crushed ice and fresh limes is conjured before my mind’s eyes, realistic down to the bead of condensation running down the side of the glass. A Shot of Thai Lime over Mango is easily wearable, but holds a lot for seasoned fragrance lovers as well, as it develops in more twists and turns as one might expect. It is interesting and nuanced and a joy to wear. All in all, I am very happy with this collection within the Jo Loves line. Jo managed to capture the delicious scent of mangoes in her cute bottles. I will enjoy spending my summer days smelling like a mango. Sprinkling of pepper optional. This entry was posted in Citrus, Floral, Fragrance Reviews, Fruity, Gourmand, Jo Loves, Jo Malone, Vetiver, Woods and tagged floral, Fragrance, Fruit, fruity-floral, Gourmand, Jo Loves, Jo Malone, Mango, Oud, Perfume, Review, Vetiver. Bookmark the permalink. 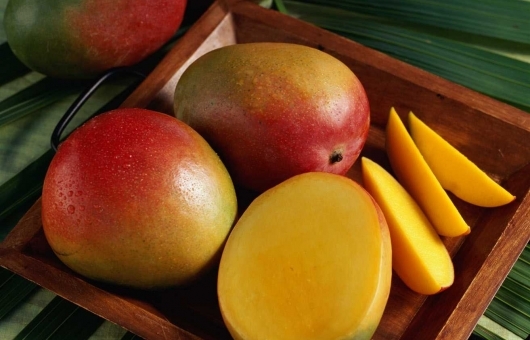 I love everything about mangos – their taste, smell, texture. So when (if?) I get a chance I’ll try all of these. Unfortunately, Jo Loves is such a localized brand that, combined with the current shipping restrictions and prices it’s almost inaccessible. I hope Jo expands her distribution eventually, I imagine it would be a line that would sell well, as the pefumes are so wearable but not in the least boring or pedestrian. Oh these sound so delish! I love mangos in all forms. I am with Undina- wish the perfumes were more accessible. No musk to be afraid of in Mango Nectar. Interesting post, Miss B! Btw, it’s mango season here, where they tend to be yellower, sweeter and juicier. I’m glad you enjoy them too. I’m so glad that you’ve had the chance to try the JoLoves perfumes too. I am really very taken with them. As you rightly point out they are delicious and decidedly wearable and anything but dull. I’m looking forward to reading your take, Dandy. Love love love mangos (for eating) and yes, I, too would not mind smelling of one! These fragrances sound fantastic…I think the Thai Lime would be more to my liking of the two. One of Brittany’s favorite fragrances is Pacifica’s Brazilian Mango Grapefruit …so refreshing and so affordable! I will look for the Pacifica line in the US, so say many good things about them. Oh, brie, you are too generous! Thank you my dear! What a mouth-watering review! I really want a mango with pepper and lime now. I hope you enjoy them as much as I do, Ellia! Mango? Oh yeah, I’m in. I’ve got some Bombay Bling coming my way just because I adore that juicy opening so much. I’ve e-mailed Jo Loves to see if they’re planning on adding samples as an option on their website. It says on the site (where the notes are listed for every fragrance) that samples are available upon request. I hope you get some to try, Dionne! They responded to my e-mail already (impressive customer service!) and said they’d send two to me, but were out of Mango Thai Lime, unfortunately. So after requesting that they might consider selling sampler sets, I asked for Mango Nectar and Green Orange and Coriander. I’m glad they responded so quickly! Good customer service is so important! I love mangoes! They are difficult to find in season here, so it is always a really nice surprise to get a good one. I will have to text these when I have the chance. Hope you get to try the perfumes, they are lovely! Mangoes are abundant in season where I live. I buy a big tray of them as part of a school fundraiser and give them to people at work, who appreciate them even if they could obtain mangoes just by walking into their own supermarket. Must try the lime and pepper option; I actually get a bit sick of mangoes towards the end of the season. Mango is a scent used so often especially in body products. I tend to keep clear of them all. 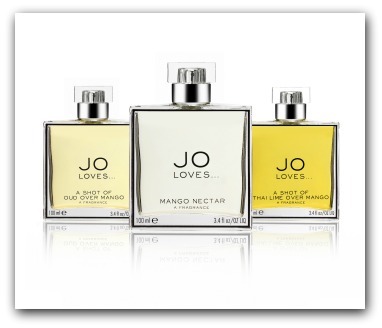 Hopefully the Jo Loves brand will do well and go into wider distribution. There is something a tad more sophisticated about it compared to Jo Malone that attracts me. I agree, Jo Loves is a lot more sophisticated and the perfumes more complex. Please don’t say that…now I really want to try them! These remind me of a tasty chopped salsa we make with jicama, mango, pineapple and hot red peppers (fresh) plus lime juice and salt. Instant euphoria. The oud here is perhaps the least attractive of the series, but the others sound wonderful. Will they ever get to NYC? I want them all! 🙂 I love mangoes and have absolutely no problem smelling like one. 😀 None at all. A red headed mango…love that image :D!!! With summer approaching I am definitely in the mood for some take-me-somewhere-tropical-type getaway scent (that was a mouthful :P). Mango is certainly somewhere high up on my list! I was wondering how the Mango “Manguiere Metisse” from Huitieme Art compared to Mango Nectar..? Never having smelt any of the two I am having a hard time deciding which to get. Love it! As someone who own too many leather and pleather motorcycle jackets (my mom once smacked my hand away from another one made of denim), I bet this would be my favorite too. Whoo hoo! That sounds wonderful!